Chicago: J.V. Mortenson, 1913. Hardcover. 12mo. Burgundy blind-embossed cloth with gilt lettering. 138pp, (2pp). Frontispiece, illustrations. Near fine. 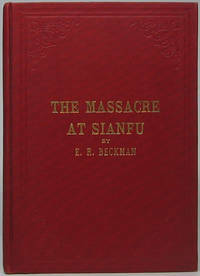 Wonderfully tight and bright first edition of this slim account of the murder of Christian missionaries in Sian Fu, China in October 1911. A handsome, gleaming copy. This edition is also seen in green and blue cloth, though no priority has been established. Madison, WI: Tracy, Gibbs & Co, n.y.. Hardcover. Small 4to. Grey cloth over bevelled boards with gilt lettering. 104pp. Frontispiece, 3 full-page plates. Very good. Faintest of binding wear, else internally tight and fine. Likely sole printing of this testimonial to this minister and theologian, long-time professor of ancient languages at Beloit College, Wisconsin. Unusual. Grand Rapids: William B. Eerdmans Publishing Company, 1984. Paperback. 8vo. Stiff glossy pictorial wrappers. ix, 130pp. Near fine. 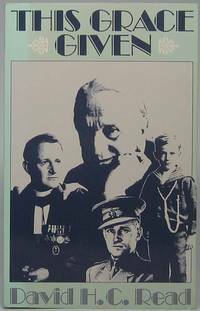 A tight and handsome first edition of this early years memoir -- covering his childhood early travels and experience as a POW of the Germans in World War Two -- by the famed Scottish-born pastor (1910-2001) of New York's Madison Avenue Presbyterian Church (1956-89) who also served as first chaplain of University of Edinburgh (1949-55) and Chaplain to Her Majesty the Queen in Scotland (1952-56). He boldly inscribes and signs the front flyleaf in black ballpoint "For Bob, Ibbie / with love from the / author, / David H.C. Read." Accompanied by a Typed Letter Signed from Read, 1p, 8½" X 11", New York, NY, 29 November 1985. Addressed to Robert H. Malott. Very good. Original folds. On "Madison Avenue Presbyterian Church" letterhead, Read chats cordially about a New York Arthritis Foundation dinner, offers "Congratulations to you on the success of your campaign," etc. Signed simply "David" at the close. Robert Malott (1926-2018) was a noted Chicago businessman, CEO of FMC Corporation, Republican politico and philanthropist. Boston: Society for the Propogation of the Faith, 1926. Hardcover. Introduction by Rev. T. Galan Duffy. Small 8vo. Burgundy cloth with gilt lettering. xxiv, 280pp. Frontispiece, numerous illustrations. Very good. Faint binding edgewear, though internally tight and near fine. 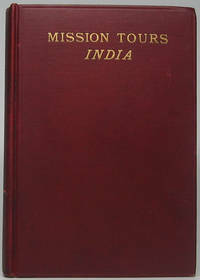 A handsome second printing of this detailed history of Catholic missionaries in India. Circular purple inkstamp of the Croatian Franciscan Fathers of Chicago near bottom of title page, rear flyleaf and three text pages. Front pastedown bears "In Memory of" pictorial card for Yugoslav monsignor Michael G. Domladovac (1887-1956), Catholic priest of Akron, Ohio, connected to this volume perhaps through Indian missionary work. Salt Lake City: Signature Books, 1989. Paperback. 16mo. Stiff glazed pictorial wrappers. xii, 570pp. Illustrations. Fine. Second printing of the second paperback edition, perfectly clean and pristine. New afterword by forensic analyst George J. Throckmorton. Eminently readable account of not-to-be-believed Mormon forger Mark Hofmann. Hailed as one of the heroes of the pivotal Battle of Jutland in 1916, this Royal Navy officer fought heroically there and was awarded the DSO (Distinguished Service Order) -- and later was awarded a second DSO for his role in quelling Turkish shore batteries at Salif; by 1931 he had risen to the rank of rear admiral, then chucked it all to enter the clergy for the Church of England and serve a poor parish in London. ALS, 2pp (single leaf), 5" X 8", London, England, 16 September n.y. Addressed to "Dear Sir" (noted American autograph collector Reverend Cornelius Greenway). Near fine. 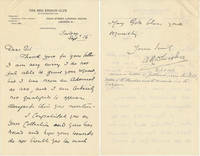 On letterhead of "The Red Ensign Club," Woods cordially denies a photo request because "I was never an Admiral at sea, and I am certainly not qualified to appear alongside those you mention. 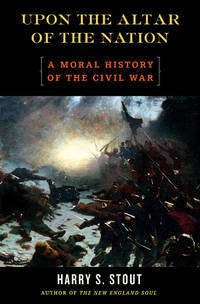 I congratulate you on your Collection and your war record and hope your wounds do not trouble you too much...." Attractively penned, with brief penciled note from Greenway at the conclusion. Philadelphia: The Jewish Publication Society of America, 1980. Hardcover. Small 4to. Grey cloth with gilt lettering. xxiii, 63pp. Very good. Internally tight and fine, though binding a bit unevenly sunned and lacking dust jacket; nonauthorial gift inscription on front pastedown. A tight and nice first edition of this new side-by-side Hebrew/English text, with Sarna providing "The Book of Job: General Introduction," Greenfield "The Language of the Book" and Greenberg "Reflections on Job's Theology." 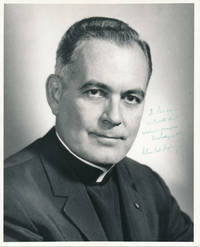 The University of Notre Dame's highly-respected long-time president (1952-87) was also a committed social activist and humanitarian. IPS, heavy stock 8" X 10", n.p., n.y. Near fine. Superb head-and-shoulders portrait of Hesburgh in middle age in suit-and-collar, nicely inscribed in green ballpoint pen in a light area at center right: "To Terrence / with all best / wishes & prayers / Devotedly in N.D., / Father Ted Hesburgh." Decent if not outstanding contrast. This noted Congregational clergyman came from a line of noted Congregational clergymen; he pastored the Church of the Pilgrims in Brooklyn, New York, for half a century and wrote much well-regarded religious history. ALS, 2pp (lettersheet), 5" X 8", Brooklyn, NY, 4 January 1882. Addressed to Henry E. Pierrepont (1808-88), a wealthy merchant of the famed Brooklyn Pierrepont family. Very good. Lightly age toned. 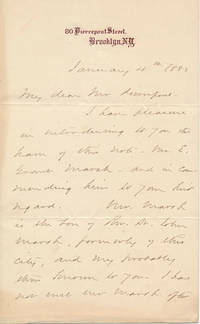 On imprinted "80 Pierrepont Street," Storrs writes to a member of the family after whom his Brooklyn, New York street was named and introduces to him "Mr. E. Grant Marsh... son of Rev. Dr. John Marsh, formerly of this city, and very probably thus known to you. I have not met Mr Marsh often in later years, as he has been living in another part of the city: but I know him well in his earlier youth, and have known of him since; and I am confident that the duties of any office entrusted to him will be promptly and faithfully performed...." Nicely penned in brown ink and boldly signed at the close. The "Rev. Dr. John Marsh" mentioned (1788-1868) was a well-known Congregational pastor and leader of the American Temperance Society. A lovely example with nice associations. Independence, MO: Press of Zion's Printing & Publishing Company, n.y.. Paperback. 12mo. Pictorial wrappers. 24pp, (2pp ads). Illustrations. Fine. Exceptionally pristine and perfect copy of this undated (likely ca. 1950) thumbnail Mormon account, titled "Joseph Smith Tells His Own Story" on front wrapper. Salt Lake City: Stevens & Wallis, Inc, 1947. Hardcover. Small 4to. Brown cloth with black lettering and rules. vii, 234pp, (4pp). Near fine/very good. Jacket a bit edgeworn and rubbed, with a couple tiny chips at spine head; circular blind-embossed ownership imprint near bottom of three text leaves. A lovely, tight and attractive first edition of this chronicle of the LDS pioneers famed 1847 westward trek to Utah. Delightful jacket graphics. Independence, MO: Press of Zion's Printing and Publishing Company, n.y.. Paperback. 16mo. Pictorial wrappers. 23pp. Fine. An unusually pristine and perfect copy of this undated (likely ca. 1950) Mormon publication by this early LDS Church president and educator (1842-94). 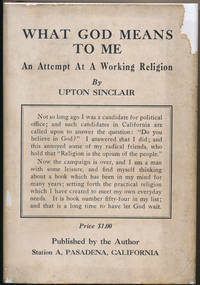 This controversial religious cult figure, who predicted the end of the world in various years during the 1920s and '30s and staunchly believed the earth was flat (backing this up with a $5,000 reward for anyone who could disprove his theory), became leader of the Christian Catholic Apostolic Church in Zion, Illinois around 1905 when that town's religious zealot founder (John Alexander Dowie) became incapacitated; he effectively controlled this town and the lives of its 6,000 residents and amassed a personal fortune doing so, though a deathbed admission of embezzlement destroyed his reputation. TLS, 1p, 8½" X 11", Zion, IL, 7 September 1922. Addressed to Waldo C. Moore. Very good. Faint edgewear, with original folds visible but not weakened. 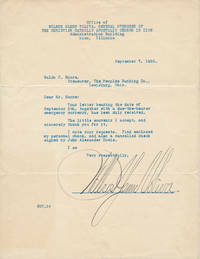 Typed in blue ink from the "Office of / WILBUR GLENN VOLIVA, GENERAL OVERSEER OF / THE CHRISTIAN CATHOLIC APOSTOLIC CHURCH IN ZION," Voliva here thanks this admirer (treasurer of The Peoples Banking Co. of Lewisburg, Ohio) for "a due-the-bearer emergency currency" and for "The Little souvenir," sending in return (not included) "my personal check, and also a cancelled c heck signed by John Alexander Dowie." Signed with his usual flamboyant full signature as large as his ego, an enormous 5" X 3½". Scarce and unusual. New York: Viking Press, 2006. Hardcover. Small 4to. 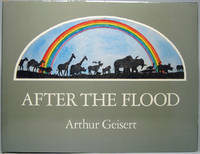 Black and blue paper over boards with gilt spine lettering, pictorial dust jacket. xxii, 552pp. Illustrations. Fine/near fine. Tight, attractive first edition. This clergyman with the Episcopal Church was appointed missionary bishop to Colorado (his turf also included New Mexico and Wyoming) in 1873, and in 1887 he became Colorado's first diocesan bishop. Bold "John F Spalding / Bishop of Colorado" in brown ink on a 5" X 1" slip with "Faithfully yours" typed above and affixed to the lower margin a 4" X ½" slip clipped from the top of the letter from which the signature was clipped, reading in type "Denver, Colorado, St. Andrew's Day, 1895." (St. Andrew's day is November 30.) Attractive example of an uncommon signature. Schenectady, NY: The Consistory, First Reformed Church, 1955. Hardcover. Small 4to. Maroon cloth with gilt lettering and decoration. 204pp. Illustrations. Near fine. A superb, tight first edition of this history of the influential early First Reformed Church of Schenectady, first built around 1682. Boldly signed and inscribed on front flyleaf by a later minister of this same church: "December 1965 / With greetings from / this church to Mrs / Frederick Browers / [?] Dykstra / Minister." (Gerald G. Dykstra, 1922-2017, served as senior pastor of this church from 1960 to 1968.). This Adventist minister was a popoular preacher and orator in his day, famed in his hometown of Concord, New Hampshire and throughout that state. ANS (pencil), heavy stock printed 5" X 3" penny postcard, Concord, NH, 12 July n.y. Near fine. Pencilled in Hook's large, erratic hand, he writes: "My Friend, / I am to Preach / at Waterloo, S.H. / next Sunday / July 19th / [upside down] John G. Hook / Will you please / arrange for / a place in Warner / for me to speak / Friday Evening 17th / and give Notice John G. Hook." 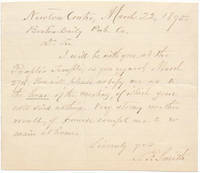 Printed (entirely in brown) verso addressed in his hand to Nehemiah G. Ordway (1828-1907), noted New Hampshire politician and governor of the Dakota Territory (1880-84), who lived in Warner. Unusual bit of Seventh Day Adventist history.